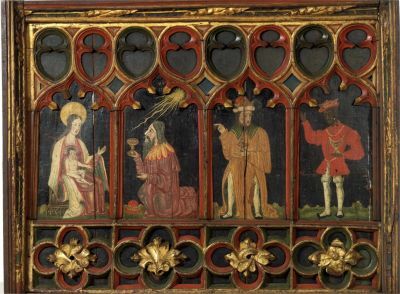 The black Magus, or King, in Renaissance Adoration pictures is an enigmatic figure as no black African king is known to have visited Europe during this period. However, blacks, at the time, were known in a wide range of other guises from slaves to saints. The black Magus image remains alive today, as seen on the coat of arms of Pope Benedict (1927– ) as well as in German Christmas cards and carved Nativity models. Paul Kaplan, The Rise of the Black Magus in Western Art (Ann Arbor: UMI Research Press, 1985); Richard C. Trexler, The Journey of the Magi: Meanings in History of a Christian Story (Princeton: Princeton University Press, 1997).